I have nothing against Mr R E Maunsell, you understand. I am quite keen on things Southern and one of my enduring memories from childhood is that of loads of Bullied engines thrashing up the GWR line from Weymouth at the end of steam in 1967 before they took the branch (ha!) line to Dorchester South and Waterloo. 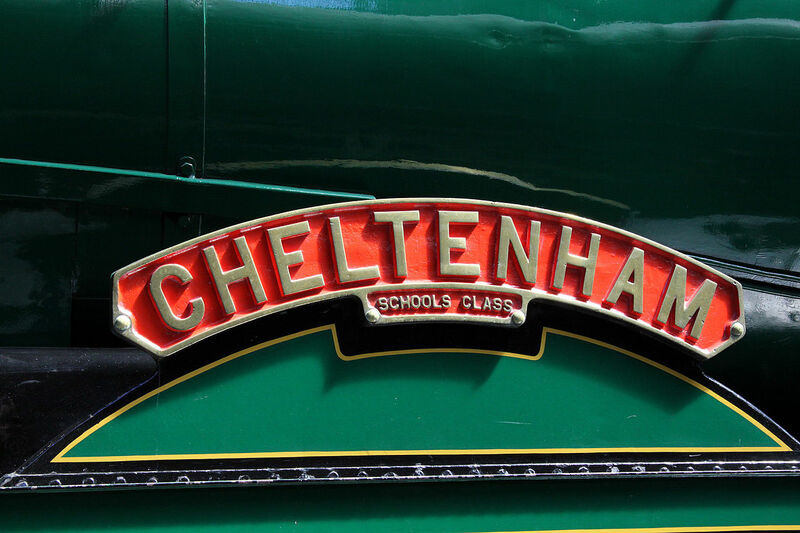 But yesterday I spent all day at Toddington getting very achy, cleaning and putting a warming fire in Schools No 925 Cheltenham so that it can be ready for its moment of fame with Cheltenham School staff and children at Cheltenham racecourse this coming Thursday. This will be a nice little historic moment. The Schools class were all launched at ceremonies where the appropriate school turned up and waved boaters and shouted ‘huzzah’ or something similar. All except ‘Cheltenham’ which, as we all know, is slap bang in GWR territory and a very long way from the Hastings line which was the main stomping ground for these engines. 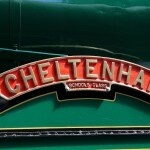 So Thursday is a chance for the Glos Warks Railway to grab that bit of neglected history, make some links with Cheltenham School and have a well publicised prelude to the Big 4 Gala that is in a fortnight, on 24th – 27th May. So I had a good chance to have a first up-close and very grubby look at a ‘Schools’. It was , indeed, very dirty, coming from the Mid Hants where its frequent use, thrashing up the Hampshire ‘Alps’ has tended to obscure its recent, gleaming restoration with an awful lot of everyday working grime and chips and bashes to the paintwork. That Malachite green, which is so bright when polished that you need sun glasses is going to take more than one day to get shining again and those wheels, painted the same colour, were certainly resisting my attempts with a brush and a bucket of diesel to get nice. Up on the footplate it all looks a bit odd when you are used to Western engines. You immediately realise that there is no family history here at all with things Swindon. Indeed it makes you realise how ‘Swindonian’ some LMS designs are, through the connection with Stanier. While a Princess Royal may look almost like the enlarged King the GWR never had, there is no family likeness with the Schools. It really is a big, chunky beast, quite the weightlifter on steroids, whereas our own beloved 4-4-0, City of Truro, is a thoroughbred flyer of sleek understated beauty. OK, I know one is basically Victorian and the other is 1920s and a lot of loco development had occurred in between but ‘Cheltenham’ is one big engine, built for heavy boat trains while Truro was built for a speedy dash from Plymouth with the Ocean Mails. The ‘Schools’ really had to do the business for the Southern and it looks as big as it could conceivably have been given the constraints of the line it was built for. In our shed at Toddington, we also have 35006 P & O Line under restoration, now getting very close indeed to steaming, and you can see that the Southern diverged a very long way from the GWR. Kings are pretty big but Merchant Navies are huge! And complex too with all sorts of variations and innovations like thermic syphons and electric lighting. These latter locos are, in my opinion, the most sophisticated that steam locos ever got in this country and it does make you realise that the GWR was much more interested in small, sometimes almost imperceptible tweaks to standard designs than in major innovation. So what you feel with GWR is design evolution whereas with the Southern there was revolution, even if that went a step too far for Mr Bulleid when he got into the ‘Leader’ concept. But it strikes me that evolution is more in tune with what people need and like and there seems no doubt in my mind that there is more love for the GWR for precisely this reason. It evolved, almost like an organic being, from its early roots and you can see the evolution throughout. That may be why the loss of Swindon works has been so mourned and we can see the consequence of that in the social problems in the town now – people can’t cope with too much change all at once. The other characteristic of the GWR’s evolution is the sense of aesthetic beauty within its family. I watched the engines, 7903, 2807 and 5542 off shed and back on again during my cleaning toils and there is surely no denying the greater beauty of the copper and brass, the sleakness of the taper boilers and the lined Brunswick green set against the exquisite English countryside. I hope to get to see Cheltenham on Thursday at Cheltenham Racecourse station but I’m taking my shades for that blooming Malachite Green! Very easily stir often the bakery for the reason that ordered and permit bread wake up. wherever it might place absent from) It isn’t really some “required” statement, however if make use of individual you are able to have an understanding of it is not just an extravagance will either. Applying elemental food items things is a wonderful way to save money on veggies and fruits which needs to be ripened.